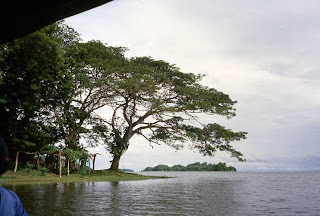 Travel information, history, issues, and stories about the seven Central American nations of Belize, Guatemala, El Salvador, Honduras, Nicaragua, Costa Rica, and Panama. 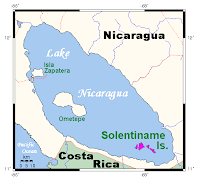 The Solentiname Archipelago is a collection of 36 small islands located in the southeastern portion of Lake Nicaragua, just nine miles west of the port city of San Carlos. The islands range in size from small uninhabited rocky outcrops to larger islands a few miles in length. The three larger islands include Mancarrón, San Fernando, and La Venada, with only the first two offering adequate facilities for tourists. Although modern amenities such as electricity and running water are rare on the rest of the islands, the overall serenity, abundant wildlife and fantastic tropical landscape makes the islands worth visiting. 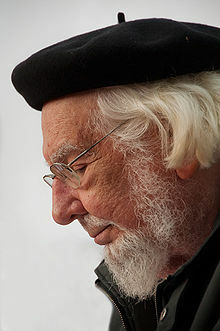 In 1966, the poet and priest Ernesto Cardenal arrived on the largest island of Mancarrón to establish a communal society and spread his overall political and religious beliefs. In addition to his influence and teachings, the few residents were also urged to view their surroundings and put their impressions onto canvas. According to a Stanford University article about the island, “Cardenal's project was based on Christian liberation theology and principles of social justice. Róger Pérez de la Rocha, a respected painter from Managua, was invited to Solentiname to teach painting techniques, while encouraging individual style and thought.” The end result was surprising and incredible with entire families painting everything that they saw. These isolated islands have since become the center of Nicaragua's legendary primitive art movement. Today, the population of the islands is approximately 1,000, which consists mostly of fishermen, families of artists, and hard-working farmers who grow everything from vegetables to coffee and cacao. For visitors, the islands offer excellent fishing in its surrounding dark-blue waters, amazing bird-watching in its dense tropical forests, and most importantly, a first-hand look into the slower-paced lifestyles that have been relatively untouched by modern society. Before exploring the islands, it is important to keep in mind that only way to get to the islands is through the city of San Carlos near the mouth of the Río San Juan. 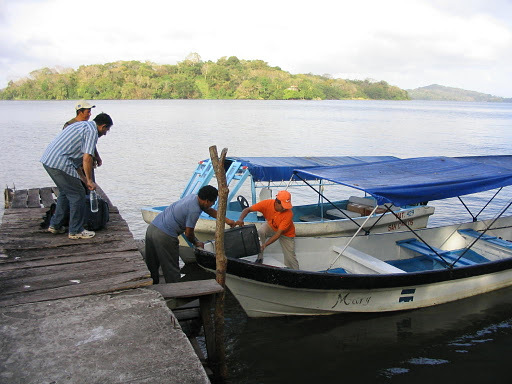 The quickest (and most expensive) way is by plane from Managua followed by a two-hour boat ride to Mancarrón. 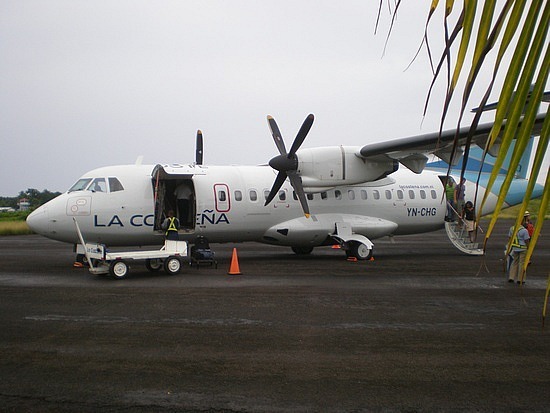 La Costeña Airlines offers daily flights from Managua to San Carlos for approximately US$55 each way departing at 1 p.m. The flight takes approximately 45 minutes. Make sure to check schedules ahead of time to avoid any problems or delays. More information can be found at their website: www.lacostena.com.ni. 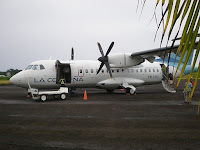 Otherwise, visitors on a budget who also have a lot of time can take a direct public bus from Managua to San Carlos. Four buses make the patience-testing, nine-hour journey from Managua’s Mayoreo terminal via Juigalpa for a fee of approximately US$7. There are, of course, connections from a series of other buses from anywhere else in the country for relatively little money. Once at the docks in San Carlos, boat travel is offered in two different types: the public boats (that depart once on Tuesdays and Fridays around 11 a.m.) or the more expensive private boats that can depart at any time. 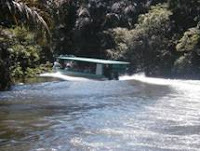 The difference in price is substantial since the public boats cost approximately US$5 one-way while the private boats can cost between US$80 and $120 for a round-trip excursion. The good part about the private boat is that the fee includes up to eight passengers and the journey can be practically custom make. But make sure to negotiate your fee ahead of time to prevent any price gauging. The journey takes approximately three hours. If you are traveling independently and by public boat, keep in mind that the return trip departs at approximately 3 a.m. on Tuesdays and Fridays. Isla Mancarrón - The main island of the archipelago is also the largest with an area of approximately 12 square-miles. It also includes the highest point of all the islands, which is 853 feet above the lake. Located close to the main dock is Ernesto Cardenal's unassuming adobe church known as the Iglesia Solentiname. 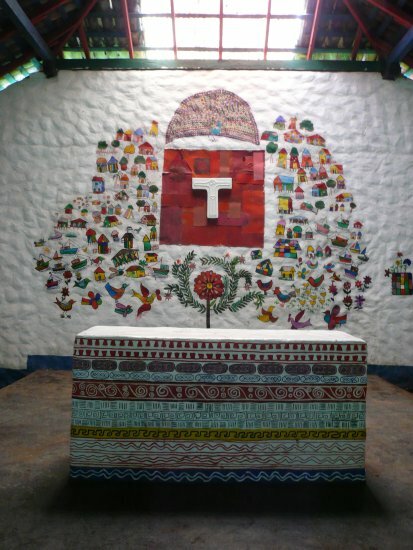 In addition to its simple interior, the exterior of the church consists of a Sandinista monument and the tomb of Alejandro Guevara, a well-known and revered rebel leader. The nearby Solentiname Development Association offers a wide variety of art along with some artist studios, books, and plenty of information about Cardenal’s influence on the island. It is one of the two best locations to purchase artwork with the other being Isla San Fernando. According to the Solentiname Alliance, visitors can stay at several overnight accommodations on the island: Hotel Mancarrón, Hospedaje Mire Estrellas, Buen Amigo, and the Hospedaje Comunidad de Solentiname. Originally a peaceful refuge for artists, this hospedaje is run by Cardenal himself, and the rustic cabins are situated on quiet grounds with access to a library and reading room. Isla San Fernando – Also known as La Isla Elvis Chavarria (for a young martyr killed in the revolution), this is the second largest island in the archipelago. In addition to its fairly large community, it includes the Museo Archipiélago de Solentiname, which is a museum, art gallery, cultural center, and arboretum all combined in one location. Admission is approximately US$1 per person and the hours of operation are generally 7 a.m. to noon and 2 to 5 p.m. The island is also home to one of a well-known family of artists known as the Piñedas. Accommodations include the Albergue Solentiname and the Don Julio Lodge. The Albergue Solentiname offers eight guest rooms with shared baths, access to a quiet porch, and plenty of water activities. The Don Julio Lodge provides more rustic accommodations in a house overlooking the lake. Both accommodations also provide guests with guided fishing trips and other custom-made excursions simply by asking. 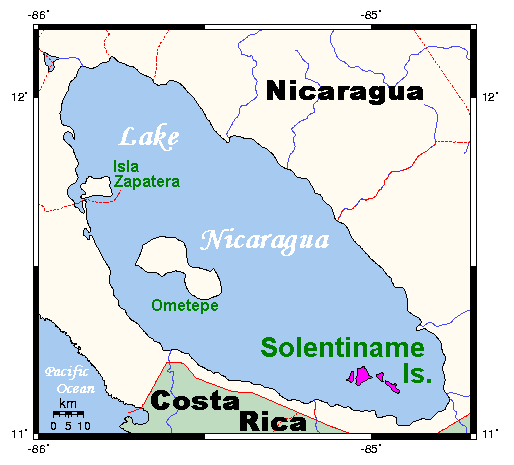 Solentiname Tours - Based in Managua, this reputable company offers a variety of guided tours throughout Nicaragua including two Solentiname tours: the Mancarrón Island Circuit Tour and the Artisans and Painters Excursions. The Mancarrón Island Circuit Tour includes a walking tour of the site around the Hotel Mancarrón with visits to Ernesto Cardenal's church, an artists' colony (El Refugio), an ancient cemetery with petroglyphs and a visit to a beautiful overlook (La Reconciliación). 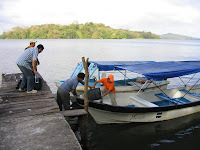 The Artisans and Painters Excursions includes guided travel by panga (motorized canoe) to a number of local artists' studios where visitors can interact with the artists as well as purchase their important artwork. More information about their company and tours can be found at their website: www.solentinametours.com. Nicaragua Adventures – This award-winning company was named the 2011 Condé Nast Traveler’s Top Travel Specialist for Nicaragua. Based in Granada, it offers a three-day, San Juan River and Solentiname Islands tour that includes roundtrip flights from Managua, all boat transportation to and from San Carlos, lunch at the Hotel Mancarrón, and a visit to Ernesto Cardenal's church and artisan village. The company has been praised by The New York Times and Outside magazine, just to name a few. More information can be found at their website: www.nica-adventures.com. Tours Nicaragua – This Managua-based company provides a long list of tours throughout the country. It currently includes a six-day Solentiname, Granada and Leon tour with a full-day motorboat tour of the islands on Day Two. The overall tour includes all transportation arrangements (including flights to and from Managua), meals and hotel accommodations. More information can be found at their website: www.toursnicaragua.com. 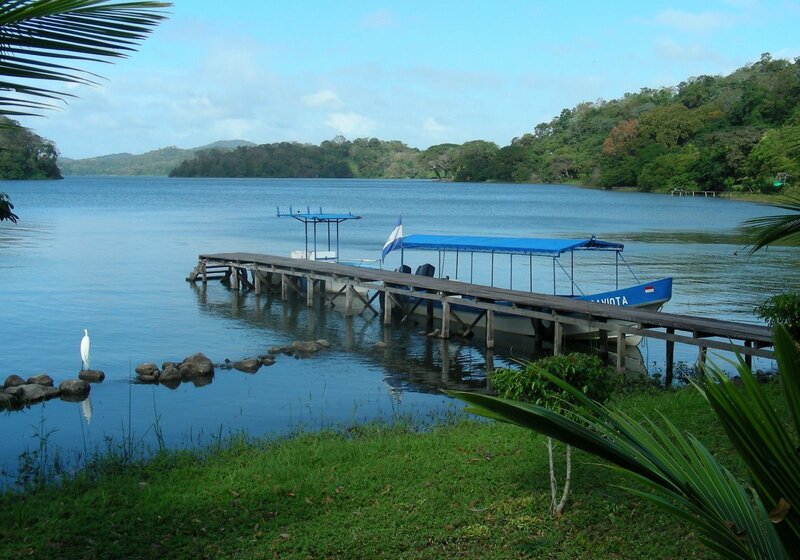 Each Central American country includes spectacular scenery with remarkable natural and man-made attractions. But within each city and town, there are also incredible stories of struggle, perseverance, and triumph. It is this combination of characteristics that has helped Central America become one of the special regions of the world. Thank you for visiting and please enjoy the stories and information. © 2011 by James Nalley. Picture Window theme. Theme images by compassandcamera. Powered by Blogger.